Start off your visit on the 20th (Wed): step into the grandiose world of Castelo de S. Jorge, admire nature's wide array of creatures at Lisbon Oceanarium, take in the spiritual surroundings of Jeronimos Monastery, then pause for some photo ops at Belém Tower, and finally don't miss a visit to Praca do Comercio (Terreiro do Paco). To find reviews, maps, traveler tips, and more tourist information, read Lisbon online travel route planner . Sao Paulo, Brazil to Lisbon is an approximately 14-hour flight. You can also do a combination of bus and flight. The time zone difference moving from Brasilia Time to Western European Time is 3 hours. Expect little chillier temperatures when traveling from Sao Paulo in March; daily highs in Lisbon reach 20°C and lows reach 10°C. Finish up your sightseeing early on the 21st (Thu) so you can go by car to Obidos. Start off your visit on the 21st (Thu): get in on the family fun at Vila Natal, step into the grandiose world of Castelo de Óbidos, then don't miss a visit to Obidos Village, and finally make a trip to Porta da Senhora da Piedade (Porta da Vila). For other places to visit, more things to do, traveler tips, and more tourist information, refer to the Obidos trip planner . Traveling by car from Lisbon to Obidos takes an hour. Alternatively, you can take a bus; or take a train. In March, daytime highs in Obidos are 19°C, while nighttime lows are 9°C. Wrap up your sightseeing on the 22nd (Fri) to allow time to drive to Fatima. Fátima is a civil parish in the municipality of Ourém, in the Portuguese Santarém District. Kick off your visit on the 22nd (Fri): steep yourself in history at Batalha Monastery, then Head underground at Grutas de Moeda, and then take in the dramatic natural features at Grutas de Mira de Aire. For where to stay, photos, more things to do, and tourist information, you can read our Fatima trip itinerary maker . Getting from Obidos to Fatima by car takes about an hour. Other options: do a combination of train and taxi; or take a bus. In March, daily temperatures in Fatima can reach 19°C, while at night they dip to 9°C. On the 22nd (Fri), wrap the sightseeing up by early afternoon so you can drive to Aveiro. Aveiro is a city and a municipality in Portugal. To see reviews, where to stay, and other tourist information, read our Aveiro trip planning app . You can drive from Fatima to Aveiro in 1.5 hours. Other options are to take a bus; or take a train. Wrap up your sightseeing on the 22nd (Fri) to allow time to take a train to Porto. Start off your visit on the 23rd (Sat): get into the urban bustle at Palacio da Bolsa, contemplate the waterfront views at Rio Douro, snap pictures at Ponte de Dom Luis I, then take in the spiritual surroundings of Porto Cathedral (Se Catedral), and finally test your problem-solving skills at popular escape rooms. To find where to stay, traveler tips, ratings, and other tourist information, refer to the Porto online trip planner . Porto is just a short distance from Aveiro. In March, daily temperatures in Porto can reach 18°C, while at night they dip to 9°C. Finish your sightseeing early on the 24th (Sun) to allow enough time to drive to Guimaraes. On the 24th (Sun), steep yourself in history at Largo da Oliveira, admire the landmark architecture of Paco dos Duques de Braganca, step into the grandiose world of Guimaraes Castle, then appreciate the extensive heritage of Centro Historico de Guimaraes, then pause for some serene contemplation at Cathedral of Santa Maria de Braga, and finally take some stellar pictures from Elevador do Bom Jesus do Monte. For other places to visit, reviews, ratings, and tourist information, read our Guimaraes trip planner . Drive from Porto to Guimaraes in an hour. Alternatively, you can take a bus; or take a train. In March, plan for daily highs up to 19°C, and evening lows to 9°C. Finish up your sightseeing early on the 25th (Mon) so you can go by car to Cascais. 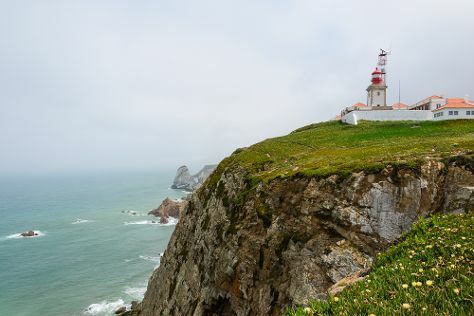 Kick off your visit on the 25th (Mon): visit a coastal fixture at Cabo da Roca, take in the dramatic natural features at Boca do Inferno, admire the landmark architecture of Sintra National Palace, then step into the grandiose world of Park and National Palace of Pena, and finally tour the pleasant surroundings at Ribeira Beach. To see more things to do, ratings, photos, and more tourist information, refer to the Cascais trip planner . Traveling by car from Guimaraes to Cascais takes 4 hours. Alternatively, you can do a combination of taxi, flight, and train; or do a combination of train and bus. In March in Cascais, expect temperatures between 21°C during the day and 10°C at night. Finish up your sightseeing early on the 26th (Tue) so you can travel back home.